You asked, we listened…our incredible Injectables & Skincare Event is back! Get ready to rock those vacay selfies with #nofilter, because our Injectable & Skincare Savings Event is back for a spring edition! Save $100s on BOTOX, fillers, Kybella double chin reduction, SkinMedica skincare, and more. Preview the savings below, then RSVP to reserve your spot. We have limited appointments available, and you don’t want to miss out. Both Dr. Buford and our talented, highly trained PA-C Kaitlyn Pell will be providing injections at the event, so you’ll have two ways to save. As a nationally recognized expert and trainer in the safe and effective use of injectables, you know you’re in good hands with Dr. Buford. Kaityln is Dr. Buford’s right-hand-gal when it comes to injectables. With years of experience and training, Kaitlyn is well-known by our patients for her fantastic results and passion for helping you look and feel fabulous. Plump your pout, rejuvenate your cheeks, say farewell to fine lines—Juvéderm® has options to do it all. Buy two syringes of any Juvéderm® product, get one syringe of equal or lesser value free. Don’t need three syringes? Save $50 on single syringes of VOLUMA, VOLBELLA, & VOLLURE. Dr. Buford will be offering all three fillers. Kaitlyn will be offering VOLUMA and VOLLURE for the cheeks and nasolabial areas. Save an additional $50 when you book with Kaitlyn! We’re offering steep discounts on some of our most popular treatments if you prepay at the event. Give your product lineup a refresh for the warmer months. Get 20% off SkinMedica®, skinbetter®, & Alastin® skincare products purchased during the event. You can also order by phone on event days to claim these savings. Buy two, get one free on SkinMedica Core products, including TNS Essential Serum, TNS Recovery Complex, TNS Eye repair, Lytera 2.0, and HA5. If you are registered with the Brilliant Distinctions program, you can earn up to 2400 points (that’s $240!) on Kybella double chin reduction treatment. For each vial of Kybella administered, you will receive 400 points. You can earn points on up to 6 vials of Kybella every 31 days. Your Brilliant Distinction points can be used for saving on future treatments with Allergan products! Cash discounts are available. We would be happy to discuss these with you during your initial consultation. As a special Thank You, we offer specialized incentives toward surgical fees. Please mention this at the time of your initial consult and a member of our team will be happy to discuss these incentives in more detail. 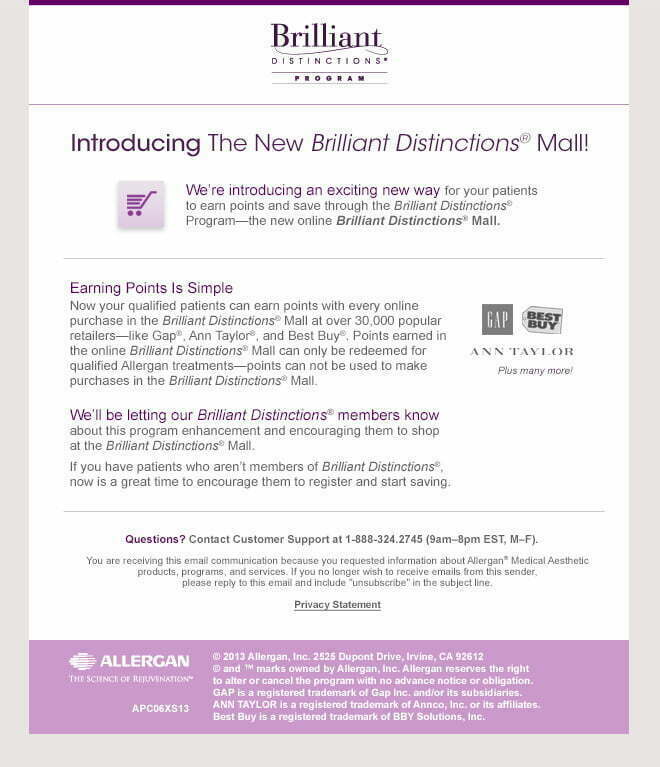 If you are already registered with Brilliant Distinctions, Allergan has launched an exciting addition to the program where you earn BD points for purchasing from various companies featured in the Brilliant Distinctions Mall in addition to savings you already receive from Allergan’s portfolio of skincare, injectable, and breast implant portfolio. Check out the announcement below and click here to register.